The Tree Stone is located in a valley just northeast of Brodir Grove, on the border of the Isinfier Plains and the Hirstaang Forest, southeast from the spring of the Harstrad River. 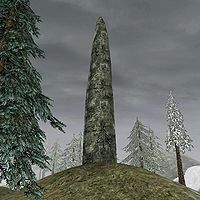 It is one of the six All-Maker Stones sacred to the Skaal and an ancient monument to the flora of Solstheim involved in The Ritual of Trees. The Ritual of Trees: Retrieve and plant the seeds to the First Tree. There is a small chance that a Wandering Lunatic – a male level 55 Nord barbarian – will spawn north of the circle of stones and slightly east of Ulfgar the Unending's Dwelling. Between 9pm and 6am, he turns into a werewolf. This page was last modified on 27 February 2014, at 01:49.